Trekking offers many fun and beautiful memories, but only if you know how to prepare and what to avoid. As for first-time trekkers, things can sound little more complicated. But don’t worry, I’m here to help. Below you will find 3 life-saving trekking tips for beginners I have accumulated throughout my years of experience. I know lots of people trek with a motto of “Let’s just go and see.” They don’t know the area. But this is not my advice for you. As a beginner, you need to know where you are about to go. It is essential to know the general info of the location. Do not risk your enjoyment by choosing a hard trail. Instead, you should start your trip with a popular, easy one so you can get used to trekking first. After you know more about the fitness level and gain some experiences, now you can handle adventurous trails. Amateurs often underestimate clothing. It is true that trekking requires a lot of walking, but it is not equivalent to less clothing. My advice is to bring enough clothes. If the weather is scorching hot, you can always take off a few layers. If you get wet for some reason, clothes are always available. If you embark on a trip in spring or autumn, when the temperature can drop low, it is wise to bring extra socks and warm clothes. Say no to cotton clothing since it is hard to dry and fails to keep you warm. I always choose wool or fleece. Remember to bring a cap or hat when trekking in summer. It will shield your head from the sun. Choose a proper pair of trekking shoes. This is probably the essential element of a good trekking trip. Try to find a comfortable and reliable pair. People bring different things when they go camping. Some want to pack as many as possible to ensure safety and utmost comfort. As for me, I prefer light trekking. Trekking involves constant use of muscles and energy. As a result, you need food that can bring you lots of vitality and dynamism, so that you can continue your trail later. For a one-day trip, I would recommend any energy fruits such as apples and bananas. They are a great source of nutrients & glucose. Nutrient bars are also an excellent idea for campers. As for long trekking trips, you should avoid perishable food. I often bring dry fruits, biscuits, and snacks, and I think they provide with enough energy for the upcoming trial. While some people think a hat is adequate for fighting UV rays, I strongly urge you to apply suncream. Even some trials offer shades; you should protect your skin from sunburn, and any permanent damages such as skin cancer. Suncream is especially crucial for those who trek to reach the top. Insects and bugs are abundant in the wild. Once you decide to trek, you have to agree to share the trail with them. For those who can’t stand bugs and mosquitos, you can bring insect repellants. Make sure that you are not allergic to any chemical elements in the spray. You never know what can happen on the trail. 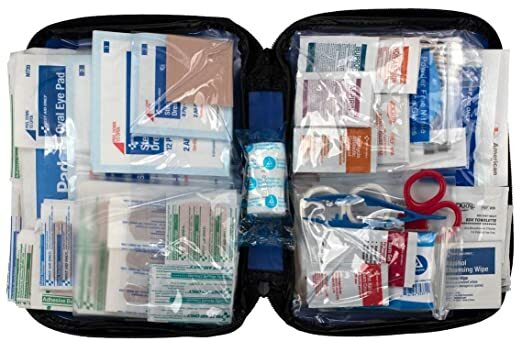 A first aid kit is a must-have item because it can be useful in the most unexpected situation. You can find all sorts of things inside a bag, from band-aids, gauze, scissors, antihistamines, and pain relievers. I always bring a small pocket knife in my trekking trips. It is better to bring a bit more than less. A knife can be handy, especially during lunch break. You can use it to cut fruits. Last but not least, bring some water. Depending on how long you plan to go, you should bring enough water to keep you hydrated. It is not hard to find a source of water in the wild, but whether or not it is drinkable is a mystery. I would recommend drinking from natural spring water. You can also bring a portable water filter if you don’t want to risk drinking infected water. I hope that the top 3 life-saving trekking tips for beginners would give you sufficient information for your upcoming trials. Trekking for beginners is all about enjoyment, so don’t worry too much and remember to stop from time to time to appreciate the surrounding.